My first time having an okonomiyaki was when I was in Grade 12 (senior) in 2000. It was just love at first taste, and I think it's all in the sauce too. Regardless, there are 2 different styles of okonomiyaki in Japan: Hiroshima style and Osaka style. Hiroshima style features layers of goodies cooked into a think pancake, where as Osaka style the goodies are mixed into the flour batter. Each to it's own, but I find the Hiroshima style has a more distinct flavour. For more information on the different styles, watch Dotch Cooking Show (Dotchi no Ryouri) for a fun comparison, don't worry, it is English subbed. There are 5 segments to it but I've already put them all on a playlist below. 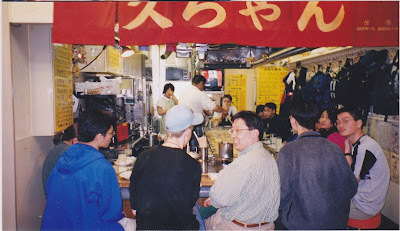 With my high school classmates and teacher back in 2000. With my family and family friends at the same place in 2011. I did not realize it was the exact same stand as where I was at in 2000. Ever since I've had an okonomi in Japan, I had been craving it ever since. I've tried to cook it at home but without a big enough grilling pan that doesn't stick, it is a little tough when the okonomi needs to be flipped. And of course, since the noodles they use is a special type of noodles that doesn't stick to the grill and doesn't get mushy, that also creates a challenge when trying to cook at home too. So, I usually end up cooking the Osaka style okonomi, which to me, is kinda lame. Once the order is received, the chef creates a thin crepe with the batter in front of you. The cooking of an okonomiyaki involves a lot of flipping the pancake back and forth and patting the pancake down. You can choose your own toppings which usually includes cabbage, shrimp, squid, pork, noodles, eggs, corn...or you can choose from their preset combinations too for a guarantee no-fail. The chef is cooking our okonomiyaki!! Maybe this time, having this video, I can learn some skills and cook it at home. The special spatula that they use is called hera. Basted with special okonomi sauce, dusted with dried seaweed. Sometimes will have mayo and bonito flakes on it too. This particular okonomiyaki stall is located in Hiroshima's Okonomiyaki Village (Okonomiyaki Mura). It is quite well known since it houses 3 stories' worth of food stalls which sells okonomiyaki, school groups, tour groups and tourists all visit there. Price is quite reasonable, for 2 people with drinks, it will run about 1200 yen. Next up, we have monjyayaki. It is similar to okonomiyaki but it is a specialty of the Kanto region. The batter is a bit more liquid. And unlike the Hiroshima style okonomiyaki, the ingredients are chopped up and mixed into the batter while cooking and the end result is like a pool of melted mess. So, for this, we found a monjya restaurant in Tokyo's Ikebukuro district called Monja-ya, across from Tokyu Hands department store. With this type of meal, you also get to choose your ingredients, choices are very similar to those that are available to okonomiyaki - cabbage base, corn, shrimp, squid, pork, etc. They will come with your food in a bowl with the batter at the bottom of it. You have to skilfully dump all the ingredients but half the runny batter onto your griddle and let it cook like below. The batter needs to thicken up and vegetables soften. I really regret not taking a video of the waiter doing our first monjya for us. He was fabulous, even the two high school girls sitting next to us were marvelling at his skill. Then you wait and watch it bubble and thicken up. Eventually, you get to scrape bits of it off the griddle with your tiny hera and eat it hot off the griddle. When cooking the monjya, you can certainly add any sauces, spices or condiment you wish. I overheard the couple sitting next to us adding okonomi sauce to her monjya, so I did the same. The flavour has much improved! Before, I found it tasted rather bland. With okonomi sauce, salt and pepper. The most wonderful part of this is the browned crispy film that the batter and sauce had left behind on the griddle. We get to carefully scrape it off and roll it into a Fruit Roll-Up to enjoy. Our dinner set also came with an order of yaki soba. This, I know how to cook. This meal was definitely an experience to be had. Though we considered it to be rather pricey - around 5000 yen for 2 orders of 2-topping monjyayaki and a yaki soba. At least Mr. Meow is now going on about recreating this fun dinner at home. We even bought a cast iron pan for a portable gas stove, now we just need to run to Daiso and get some hera. In my opinion, both types of griddle cakes are delicious since they're similar in flavour, but texture is of course very different - one is of substantial substance with crispiness and chewiness together in one, and the other is gooey and doesn't really seem to fill you up. But I find monjyayaki to be more fun because you do it yourself. We finished the meal with some Japanese favourite nama-choco ice cream. We'll let you use your imagination to see what it resembles.